After visiting Flower Festival and bonsai exhibition in Girona we headed to Barcelona. It welcomed us with a sunny weather and a cool wind from the sea. To our surprise Barcelona was much colder at this time of the year than our native Kiev, taking into account that it is much more to the south than Kiev. Who knows, maybe that's only a current year situation. So we wore some warm jackets and started exploring the city. As we arrived almost in the evening, we decided to walk through La Ramblas and the Gothic Quarter, find a nice restaurant and enjoy our first evening in Barcelona. La Ramblas is a famous street in Barcelona where the fortress walls stood earlier. It starts from the Columbus Column near the port and ends up at the Plaça Catalunya. Now this is a wide crowded street full of street cafes, restaurants, gift shops, living statues and tourists. La Ramblas lead us to the Plaça Catalunya, a wide square with beautiful fountains, a lot of people sitting on the benches and on the grass, feeding a number of pigeons and enjoying the warm light of the setting sun. After Plaça we had a short walk to the new part of the city, stopped near Casa Batlo, designed by the great and very talented Catalonian architect Antoni Gaudi. After that we went back to the old part of the town and started looking for a nice place for a dinner. Walking through the narrow medieval streets between the old stone buildings, we suddenly found an entrance to the inner courtyard with a lot of blooming flowerbeds and a nice cozy restaurant in the corner. That was exactly what we wanted. We ordered degustation menu, that included different kinds of Catalonian tapas and a bottle of sangria. Let me tell you more about tapas. The menu included about 6 of them: bloody Catalonian sausages, brave potatoes (french fried potato cubes with a hot sauce and mayo), salad made of fresh local vegetables, potato omelette, marinated anchovies, plate of local cheese, some jamon and tomato bread. Each plate included a small portion of food, but everything was so tasty and nutritious, that in fact we were gorged and satisfied. At the middle of our dinner a musician started performing Spanish guitar playing, that made a great atmosphere. We felt very happy sitting in a cozy restaurant in the heart of the old Barcelona, eating traditional food, soaking cool sangria and listening to a Spanish guitar... This was our reward for the hard work during the year and a long tiring winter. Our first evening in Barcelona was fantastic. Next day we decided to take a two days trip on a Barcelona Bus Turistic. We've bought tickets via this website, because it had a 10% discount. The bus has three routes (Red, Blue and Green), that go through the main sightseeing and it stops near each of them, so you can hop on and off at any stop so many times, as you need. Also they give you a little book with a lot of discounts at different museums, restaurants and shops. 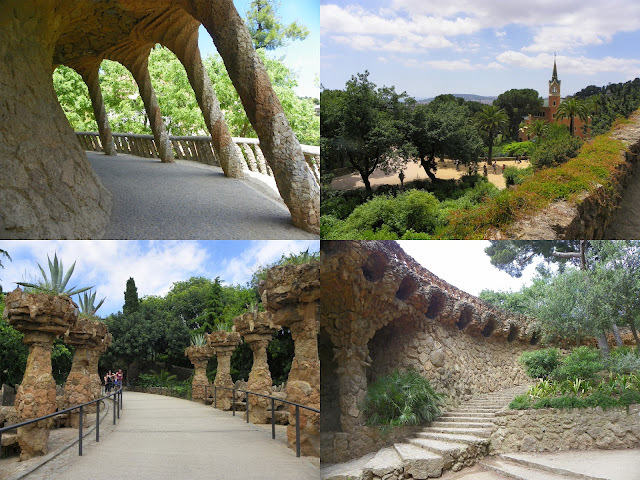 We started our journey from the Columbus Column and decided to go to the Park Güell - another great Gaudi's creation. After a nice trip on the second floor of Bus Turistic with wind in our hair we've finally got off the bus near the famous park. By the way, visiting the park is free of charge. Two beautiful gingerbread houses met us on the entrance. 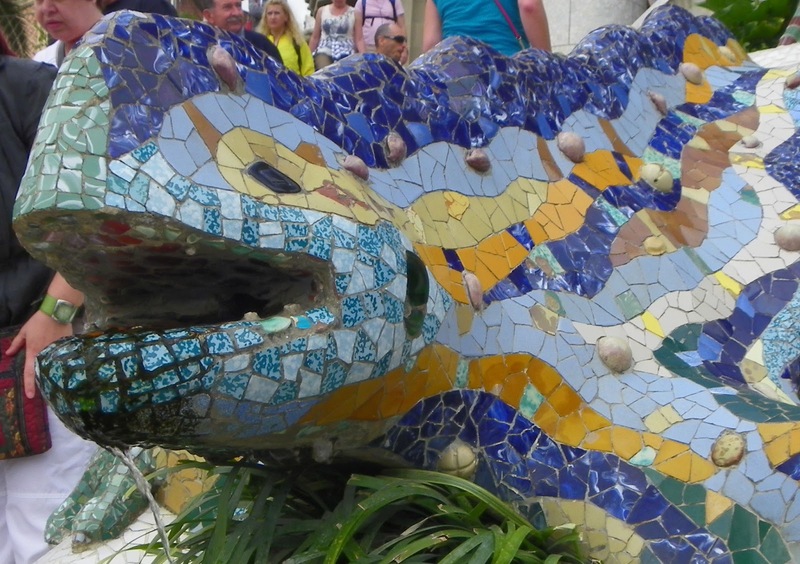 And here is a famous lizard with ceramic mosaics. The number of visitors was really big, so it was impossible to take a good photo. The park is quite big and the far you get from the entrance, the less people you meet. Park is full of different architectural constructions, exotic trees, blooming flowers, ceramic mosaics and green kakadu parrots (actually the whole city is full of them). There is an observation platform at the top of the hill. A great view on the city and the sea opens from it. Here is how the Sagrada Familia Cathedral looks like. It is really huge and contrasting to the other buildings, I'll show you more photos from it later. 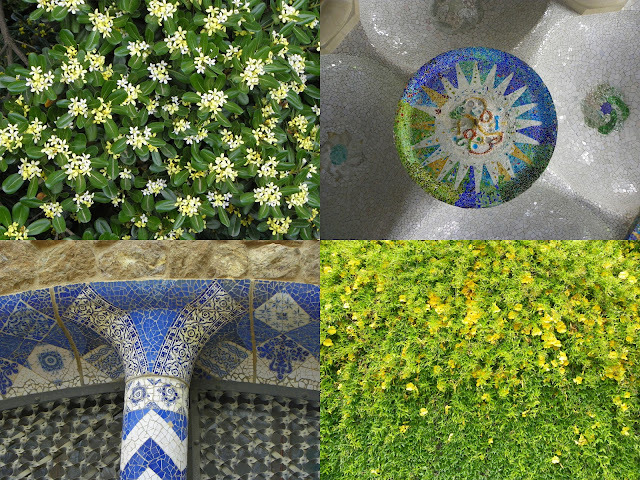 Flowers and ceramic mosaics are everywhere and that's beautiful. After a long time walking in the park we headed to one of the nearby cafes and had a nice lunch with lasagna, casseroles and some sweet iced tea. Then got on the Bus Turistic and got out on the next stop - a part of the city that is famous with it's best bakeries and pastry. 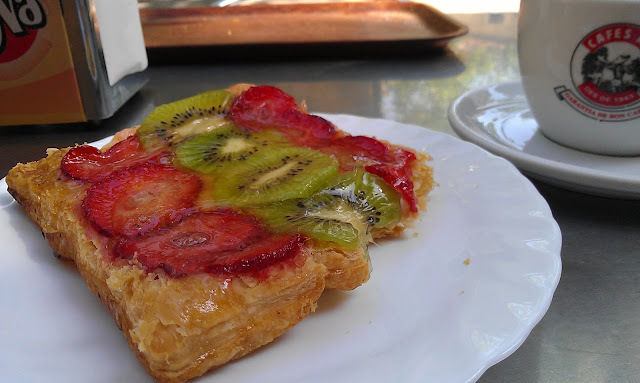 We walked trough the narrow old streets a little and appeared at the Placa with a cute street cafe. We ordered cappuccino and some sweets. Mmm, that was yummy. Then bus again, it drove us back to the port. We've completed the blue route this day and a half of the red one. We didn't have a goal to see all the sightseeings, so we didn't have a strict plan, we just wanted to rest and enjoy our stay in Barcelona by doing what we want at a particular moment, so after some more walking, shopping, etc., we decided to have a dinner on La Ramblas. I've read a lot of tourist's reviews and stories about visiting Barcelona, while planning our trip, and some of them were saying that street restaurants on La Ramblas are more expensive and food is less quality here. But anyway we decided to try ourselves and had a very good experience in Amaya restaurant. We ordered paella with seafood and fish, some brave potatoes and local beer. Everything was great and tasty, good service and good quality, maybe just a little bit more expensive, but that was expected. That's how we spent our first day and a half in Barcelona.